On 27th December, Poloniex issued a notice to all its legacy account holders advising them of its latest version of verification. The US-based exchange is looking to upgrade its customer registration process to match industry regulation requirements. Unfortunately, legacy account holders will have their accounts disabled if they do not comply. Meanwhile new customers will be required to go through the new verification process so as to trade on the platform. With South Korea raising concerns and releasing a set of regulations to put a ban on anonymous accounts on exchanges, the move by Poloniex was expected. Basically, Poloniex is positioning itself to comply with regulations and ensure that its platform is free from money laundering and other criminal activities. Plus other governments including the US, China and India have also raised concerns about cryptocurrency exchanges that have anonymous account holders. On the date of the deadline, Poloniex plans to close all open orders for legacy account holders, disable trading and lending, and switch off auto-renew on all loans with those accounts. However, there will be an 8-week wind-down period for margin positions, after which they will all be closed. Although withdrawals will remain active prior to the deadline, deposit addresses will be revoked and legacy account holders will only be able to recover their deposits after fully verifying their accounts. On verification, full functionality will be restored, and an equivalent withdrawal increase of 25,000USD will be implemented. It is not clear how many legacy accounts will be affected. But the exact deadline date has not been released, therefore legacy account holders will have to wait until the first quarter of 2018 to be notified of the deadline for verifying their account. In addition Poloniex, promises to issue a notice in advance of the new requirements being implemented. Furthermore, account holders are encouraged to verify their legacy accounts in order to avoid any inconvenience. According to CoinMarketCap, Poloniex (a State of Delaware incorporated exchange) has had over $1bn in trading volume in the last 24 hours. Therefore, its new requirement for its legacy account holders will surely affect a large number of cryptocurrency traders and enthusiasts. 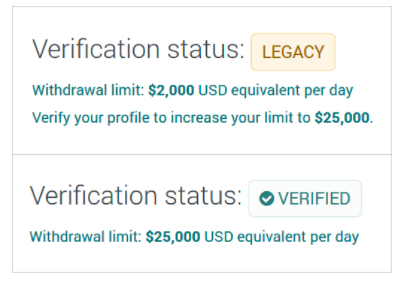 Talk to us and let us know you thoughts and opinions on the new verification requirements that Poloniex will impose on its legacy account users!